Looking For Your Plot Plan? CONTACT | HOURS | LOCATION | DIRECTIONS | RECORDING FEES | FORMS OF PAYMENT | RECORDING CHECKLIST | HOW TO GET A COPY OF YOUR DEED | LOOKING FOR YOUR PLOT PLAN? 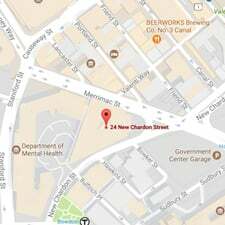 The Suffolk Registry of Deeds is located on the first floor of the Edward W. Brooke Courthouse at 24 New Chardon St. on the corner of New Chardon and Merrimack Streets in Boston, MA. The Registry is within a short distance of TD Garden, Government Center, and Fanueil Hall. The closest MBTA train stations are: Haymarket (Green & Orange Lines), North Station (Green & Orange Lines), Government Center (Green & Blue Lines), Park Street (Green & Red Lines), and Charles St/MGH on the Red Line. There are also several bus routes serving the area, many of which are based at Haymarket Station. The Registry is adjacent to Interstate 93 with several private pay-to-park lots in the area. PLEASE NOTE: The Edward W. Brooke Courthouse does not offer parking. Please make checks payable to "Commonwealth of Massachusetts"; recording checks must be in the exact amount when documents are mailed into the registry. No change will be given (It is recommended that the amount of the check be left blank when recording at the registry counter, until documents are approved for recording). Please have a name, address and phone number on each check. We do not accept out of state personal checks. We do not accept any starter checks. A separate check is required for excise tax. Separate checks for Recorded Land and Registered Land are required. Separate checks for the recording of Plans are required. All documents must be legible and signed with an original signature or be a certified true-attested copy. When required, they must be notarized and the notary’s name must be printed under the signature along with the expiration date of the notary's commission. An excise tax applies to all deeds with a consideration greater than $100. The tax rate is 2.28 for each $500 or fraction of consideration. Please use our Excise Tax Calculator. Grantee’s address must appear on all deeds and assignments of mortgage. A property address must be put in the left margin for all deeds and mortgages. The re-recording of an original document to correct an error or omission is prohibited. Documents containing social security numbers must have the number redacted (covered, made illegible) prior to recording. If the document refers to an attached exhibit, the exhibit must be attached. Printing shall be on one side only; double-sided pages will not be accepted. Please note, double-sided pages are accepted for recording in Registered Land. The text on all document pages must be of sufficient size to be legibly reproduced on a standard Registry scanner. The first page of all documents must contain sufficient space to allow a barcode label and excise tax stamp, if required, to be affixed to the document. All document pages and attachments must be on paper that is no larger than 8.5 inches x 14 inches. Addresses and telephone numbers must be noted on all checks. Checks for recording fees must be in the exact amount and should be payable to the "Commonwealth of Massachusetts", deeds excise must be on a separate check. A self-addressed, stamped envelope must be included with documents submitted by mail or recorded at the Recorded Land counter. All documents must have the property address stated on the first page (In the left margin for deeds and mortgages). All documents must reference the certificate number of the deed associated with the property. The address of the Grantee (or assignee) must be stated in the document. On a discharge/release, the document number for the mortgage you would like discharged is required. If a document is required to be filed in both Recorded and Registered Land, it should be filed in Registered Land first. Separate checks are required for two way documents. The seller or borrower must sign the document in the exact same way they took title. AKA (also-known-as) and NKA (now-known-as) are not accepted. FKA (formerly-known-as) is only allowed with a marriage, a divorce, or a legal name change decree attached. An affidavit of no divorce and a death certificate is required from the surviving spouse. A proper legal description for Registered Land should include Lot #, Plan #, and the Certificate of Title where the plan is filed. All documents must be legible and capable of being reproduced by staff. A copy or certified copy of your deed can be obtained at the Suffolk Registry of Deeds, located in the Edward W. Brooke Courthouse, 24 New Chardon St. 1st Floor, Boston, MA 02114. The Registry is open and customer service is available to assist you from 8:30 am to 4:15 pm, Monday through Friday. The cost of a copy is $.50 per page, $1.00 per page for certified copies. Most deeds are approximately two pages long, after signatures and notarization. You may pay by cash, check or money order. By statute, the Registry is not authorized to accept credit card payments. If you cannot make it to the Registry, you may send a request by mail. A check made out to the “Commonwealth of Massachusetts” for the exact amount of the transaction. A self-addressed, stamped envelope for the return of the deed to you. You can locate and print a non-certified copy of your deed online for free. From http://suffolkdeeds.com click on 'Document Search'. You will be brought to the Suffolk Registry page at www.masslandrecords.com/suffolk, with the search criteria set to Recorded Land Name Search. If your property is Registered Land click on Search Criteria in the top left corner and click Registered Land (Land Court) - Name Search. masslandrecords.com document images are displayed using Adobe Reader. In order to view, print, or download document images you must have Adobe Reader installed on your computer or device. Adobe Reader does not work in the Google Chrome browser. You must use a different browser to view, print, or download documents from masslandrecords.com. masslandrecords.com uses pop-up windows to view, print, and download documents. Your pop-up blocker must be turned off. When you locate a document of interest, click on the box to the left of that item, then click on the name displayed for that document. Click on 'Print Document' located at the upper right of the indexed information area. From the document preview window- Click on 'Print Document' at the top right of the window. The Registry does not have certified plot plans. In most instances the Registry has a "Plan of the Land" (which show the layout of streets and lots for a given location). In addition, "Floor Plans" and "Site Plans" for condominiums are also available. Please read below for information on certified plot plans from the City of Boston's Inspectional Services Department. WHEN DO YOU NEED A CERTIFIED PLOT PLAN? When filing a long form application, (BD-1, BD-1A or BD-2, 2A), application to amend plans, and permission for use of premises application. WHY DO YOU NEED A CERTIFIED PLOT PLAN? To professionally identify the locations of buildings and structures on the site. This information is necessary to allow the zoning and plan review departments to evaluate your application fairly and completely. WHERE CAN YOU GET A CERTIFIED PLOT PLAN? From the owner of the land, if you lease. From the mortgage bank, or land company you purchased the land and/or building from. Consult your yellow pages of the phone book, under surveyors or engineers select one, and have them draw a plot plan from your deed. 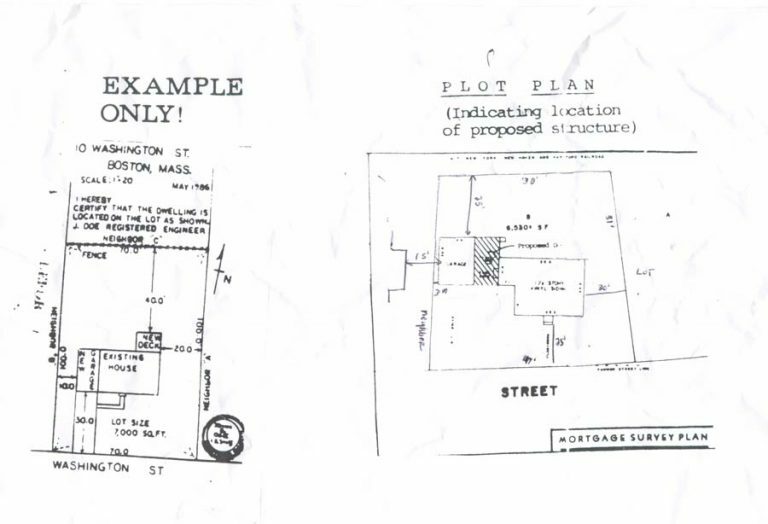 *NOTE: IF SOMEONE PREVIOUSLY HAS OR IF YOU ARE PRESENTLY ENCLOSING OR ADDING SOMETHING ON TO YOUR HOUSE/BUILDING OR PROPERTY THAT IS NOT SHOWN ON THE CURRENT CERTIFIED PLOT PLAN YOU WILL HAVE TO CONSULT WITH A REGISTERED ENGINEER OR LAND SURVEYOR TO MAKE THE REQUIRED CHANGES TO THE CERTIFIED PLOT PLAN YOU HAVE NOW.